The PAT testing competency course is not a City and Guilds qualification but it does provide a Certificate of Competency to all those successful candidates, in keeping with the regulations which state that a person completing PAT work must be competent. Another benefit is that the competency course provides practical and theoretical learning elements. This means that candidates are able to learn the importance of practice alongside the theory portion of the course. 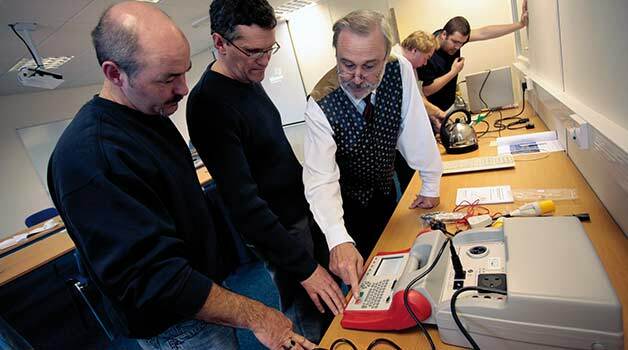 The course offers plenty of opportunity to PAT test equipment using pat machinery in order to practice skills. Upon successful completion of the learning objectives candidates will be able to carry out PAT work and record results accurately. A certificate of Competence is awarded to those passing the assessment and the course. The PAT testing course is suitable for anyone with an interest in the subject, those who would like to build a PAT testing career or business, or those who would like to carry out their appliance testing in-house. Your suitability for the course does not depend on whether you have previous electrical experience, but this may help you understand the subject more. However, it is not necessary for success. There are no entry requirements other than an interest in the subject and a willingness to learn. All learners must be willing to engage in the subject and take in the information provided. All learners are encouraged read and bring to the course a copy of the IEE Code of Practice for reference purposes. It is a book that will greatly help in any future career in PAT testing and should be something all PAT technicians own and are familiar with. Unfortunately we are now no longer running any courses at our North London (South Mimms) venue. Become a competent PAT tester in just one day with our very own PAT testing course.